Is your beef local beef? Listen, I’m not into slaughtering animals. My diet is mostly plant-based and I rarely eat meat. If I do eat meat, I know exactly who killed it and where it came from and what kind of life it had. So why am I doing this post? I’m doing this post because I recognize that people like meat. People think meat is a cultural thing and that they’re entitled to eat it. If you want to kill and eat an animal, I’m ok with that. BUT, it’s HOW you kill the animal that I have a problem with. This is why I only eat meat if I know who killed it and how—aka local beef. Local beef is great, but before you purchase local beef, you need to figure out a few things. I’ve compiled a list of questions you can and should ask your local beef provider. 1. Do you have one location or several? The reason you want to ask this question is because this will be the easiest way for you to determine if you’re dealing with a legit local beef farm or an industrial farm masquerading as a local one. If they tell you they have several locations, that should be a big red flag—aka not local beef. 2. How often are the cows outside? You want to ask this question rather than “are they given unlimited access to the pasture” because they could very well be given unlimited access to the pasture, but they may not actually be going into the pasture for whatever reason. The cows should be outside pretty much all the time when it’s real local beef. 3. Do you provide shelter for the cows outside? Best answer: yes, but they are not contained in this shelter. If the cows are outside all the time, you want to be sure they have some adequate shelter for inclement weather. 4. Do you raise both male and female cows? If so, how do you regulate breeding? Best answer: yes, we do our own breeding and regulate breeding with castration. The reason you want this answer is because this way you know they are not bringing in cows from somewhere and that the farm truly is local beef. 5. Are the male cows castrated? If so, how? Is anesthesia used? Best answer: yes to the anesthesia! If they don’t castrate their cows, that’s great. The problem is that most places do, so hoping they’ll say “no” might indicate that they engage in unethical practices to inhibit breeding. You want them to say that they use local anesthesia and that they simply cut them off. Look up more about these practices to find out why you want them to use anesthesia. If you speak to the actual farmer and he or she says they do it themselves, that’s even better. That’s true local beef, where the farmer takes care of his cows. 6. If the cows get sick, are they treated and how? Best answer: yes, they are treated. The farmer should tell you exactly how the local beef cows are treated and if they have an on-site vet that comes as needed. 7. How is the pasture maintained? Chances are your farmer won’t actually say “organically”, they’ll just tell you that they don’t spray the pasture with anything and the cows simply maintain it by grazing. Yay, local beef cows! 8. Are the cows purely grass-fed or are they fed supplemental grains? Best answer: mostly grass fed. Some farmers feed their local beef cows a bit of supplemental grains to take the “gamey” taste out of the meat like you get with deer or squirrel, but ideally, you’d like the cows to be almost purely grass-fed. Ask what the supplemental grains consist of and if they are genetically modified (corn and soy). 9. Any growth hormones used? If a farmer tells you they use growth hormones, you should just hang up right then, unless you want an enlarged prostate, acne, and overweight children. That’s not local beef, peeps. 10. Are the cows tagged/branded? If so, is anesthesia used? 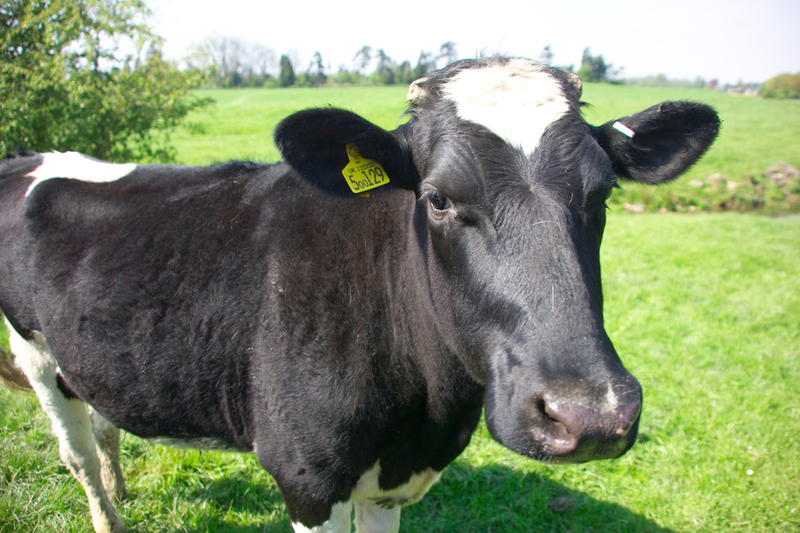 Sorry, but most farmers will at least ear tag their local beef cows, like the cow you see in the above picture. If they say they brand, you should probably just end the call, because if they are cruel enough to brand an animal, chances are they are not using anesthesia. NOW. It is time for the slaughter questions. Brace yourself. 11. Do you process your own beef? Unfortunately in the United States, if you want to sell your meat, your animals have to be killed at a USDA approved slaughterhouse. So chances are if you are buying this local beef meat, it will need to be killed at a slaughterhouse. If they tell you that they process their own beef, it’s technically illegal for you to buy it. 12. Where is the slaughterhouse? Have them give you the name of the slaughterhouse and the exact location. Look up how far away it is from the farm. It should be less than an hour away if it’s for local beef. 13. How are the cows transported to the slaughterhouse? If they call a company to come and take the cows, that’s not really local beef and chances are they probably don’t care about the cows and how they are transported. The more details they can give you, the better. 14. How many animals does the slaughterhouse kill per day? Best answer: less than 10. If this is a really local place, you’ll want them to have minimal slaughtering going on. The more animals they slaughter, the less humane they treat them. The answer to this question will also tell you how large the slaughterhouse is. If they tell you that they slaughter hundreds of animals per day, this is a commercial slaughterhouse and chances are your cow is not dying humanely. That’s not local beef for you. 15. How do they slaughter the cows? Best answer: they shoot them with a gun. This is the better option, as terrible as it sounds, because this means your local beef cows are not getting stunned and tortured before they die. If the farmer tells you he doesn’t know how the cows die, you can contact the slaughterhouse, but I would most likely end the call. If the farmer doesn’t care how his cows are being killed, what else doesn’t he care about? You want to make sure the cows are killed quickly and not being dismembered while they are still alive. 16. Can I visit the slaughterhouse? The farmer may not know the answer to this question, and that’s fine. You can always contact the slaughterhouse. But, if he tells you they let people in and that you can go see it, this is great news. You’ll want to confirm with the slaughterhouse though. Commercial slaughterhouses will not let you in there. 17. How are you sure that you’re getting your cows back? The farmer should tell you a detailed process for how he knows he’s getting his cows back, such as he knows the people at the slaughterhouse personally, his meat tastes distinct from all other meats, etc. If he says he has no idea, then this is not someone who is very informed. 18. Can I see the farm? Any farmer who is proud of his animals and the way he treats them will welcome you to his farm to check out his local beef. After you ask all these lovely questions, schedule a trip to see both the farm and the slaughterhouse. This is local beef for you! You’ll feel so much better and more conscious purchasing and eating this beef if you know exactly where it came from, how it lived and died, and what it ate. Support humane cow farms!